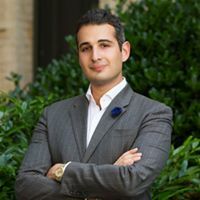 Sammy Dweck comes from a longtime Washington real estate family that imparted the values of personal and professional integrity. Since he began his career at twenty, Sammy has always understood that the trust each client places in him is a privilege and an honor. His enduring efforts to serve the best interests of his clients have earned him a reputation for being an honest, sincere, and effective advocate and advisor. Sammy’s clients are empowered by his extensive market knowledge and are charmed by his personal touch and tenacity. With candor and spirit, he promises an engaging and unique experience and offers an unparalleled commitment to client service. A specialist in pre-war condominiums and co-operatives, Sammy takes particular joy in brokering sales of the historic Beaux Arts properties featured in James Goode’s Best Addresses. His broad portfolio of sales includes every type of property from studio and one bedroom condos to penthouses, townhomes, and estates, and reflects his philosophy that everyone deserves a special home at every price point. Sammy appreciates the symbiosis of the distinctive Sotheby’s auction house brand with its real estate division, which affords his clients access to exceptional marketing resources and luxurious perks. His own affinity for the arts and design is expressed in his growing collection of later 20th century posters and objets that pay homage to the roaring twenties and the art deco era. Sammy is an alumnus of New York University, where he earned a degree in Politics. Sammy was named one of the National Association of REALTORS “30 Under 30” in 2018. He previously served on the DCAR Public Policy Committee and is an engaged citizen who is known for writing personal notes to elected officials. Sammy also serves as an Ambassador for Safe Shores, the D.C. Children’s Advocacy Center. He lives with his Havanese dog Joey in a pre-war co-op in Kalorama, a leafy residential enclave just uphill from the heart of the city.